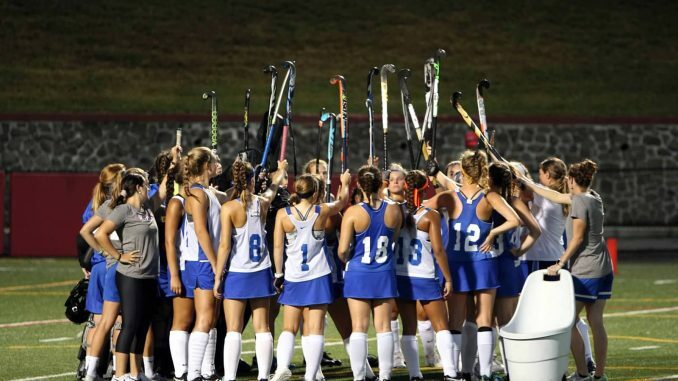 The field hockey team has gotten off to a fast start, going 4-1 in their first five games of the season. The Hawks beat Utica College 7-1, St. Lawrence University 6-3 Stockton University 2-1 and Rensselaer Polytechnic Institute 3-2 while losing to Montclair State University. Losing to both Utica and Stockton last year, the two wins marks improvement for New Paltz early on in the year. In the first game of the year, New Paltz found themselves down early after Utica’s third-year midfielder Josie Sgarlata found the back of the net to make it 1-0. The Pioneer’s one goal would be no match for the Hawk’s seven, as New Paltz created an offensive onslaught. First-year midfielder Morgan Gunter was the first to score for the Hawks, while second-year forward Carly Croteau put two past the goalie, in the first half to make it 3-1 New Paltz. The Hawks powered through the second half, scoring four more goals to take the 7-1 advantage. First-year back Jessica Ascencao scored once while third-year forward Sophia Urrutia scored two back-to-back goals. Croteau topped it off with a hat trick, scoring her third goal to seal the deal for New Paltz. The following day on Sept. 2, the Hawks fell behind early again, after St. Lawrence scored two goals to take the 2-0 advantage within the first 10 minutes of the match. New Paltz quickly stopped the Saints momentum, however, getting on the board with a goal from third-year forward Kaitlyn Gunter at 13:51. Later at 22:44 in the first half, Ascencao found the back of the net on an assist by fourth-year back Samantha Ackerman to tie the match at two. Three minutes later, Ascencao scored again off of a penalty to give the Hawks the lead. With the Hawks pushing forward, Croteau also scored, making it 4-2 New Paltz. A late first half goal by St. Lawrence did not falter the Hawk’s in the second; however, as Ascencao found the score sheet once again for a hat trick early into the half. Croteau scored again as well, to give New Paltz the 6-3 advantage and the win. After losing to Montclair State on Sept. 6, the Hawks came back hungry on Saturday, Sept. 8 to beat Stockton University on the road, 2-1. The Ospreys got on the board first, coming off a goal from second-year forward Britney Stein to give them the 1-0 advantage within the first ten minutes of the game. At 31:34, New Paltz answered back, tying the score at one with a Ascencao goal assisted by Ackerman. In a high energy second half, the Hawks finally found the back of the net at 54:19, with Croteau scoring her sixth goal of the season. Stockton could not recover, giving New Paltz the match 2-1. The Hawks will take on St. John Fisher College, Skidmore College and University of Rochester before beginning State University of New York Athletic Conference (SUNYAC) play.